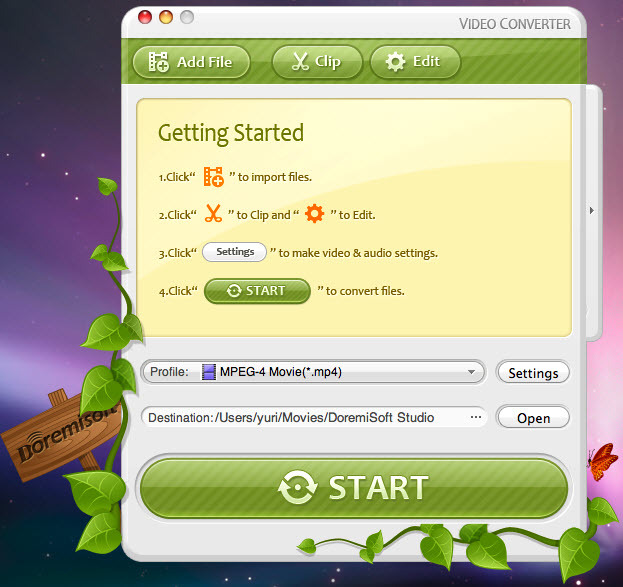 Doremisoft Video Converter for Mac is the perfect software for Mac users to convert all sorts of videos on Mac. It supports converting SD video such as MP4, WMV, AVI, MOV, MPEG-1, MPEG-2, etc. HD video including MKV, MOD, AVCHD MTS, M2TS, TOD, HD MPEG-4 etc. With Doremisoft Video Converter for Mac, you can easily import all kinds of videos to iMovie, iTunes, Quicktime, FCP, FCE,iPad, iPod, iPhone, Blackberry, PSP, PS3, etc. ...... This Mac Video Converter is also a best Audio Converter that can convert between audios such as MP3, WAV, AAC, M4A, AC3, FLAC, MP2, MKA, AMR, etc and allows you extract audio from video. Doremisoft Mac Video Converter is also a powerful editing tool that can trim video; crop video; capture image from video to JPG, PNG, GIF or BMP, etc; set effects like Brightness, Contrast and Saturation; merge several video into one and so forth. Player: iPod, iPhone, iPad, PSP, PS3, Apple TV, BlackBerry, Archos, Creative Zen, iRiver, etc. Qweas is providing links to Doremisoft Mac Video Converter for Mac 3.0.1 as a courtesy, and makes no representations regarding Doremisoft Mac Video Converter for Mac or any other applications or any information related thereto. Any questions, complaints or claims regarding this application Doremisoft Mac Video Converter for Mac 3.0.1 must be directed to the appropriate software vendor. You may click the publisher link of Doremisoft Mac Video Converter for Mac on the top of this page to get more details about the vendor.